As a verified procrastinator, I am always enthusiastic about easy recipes for last minute baking. 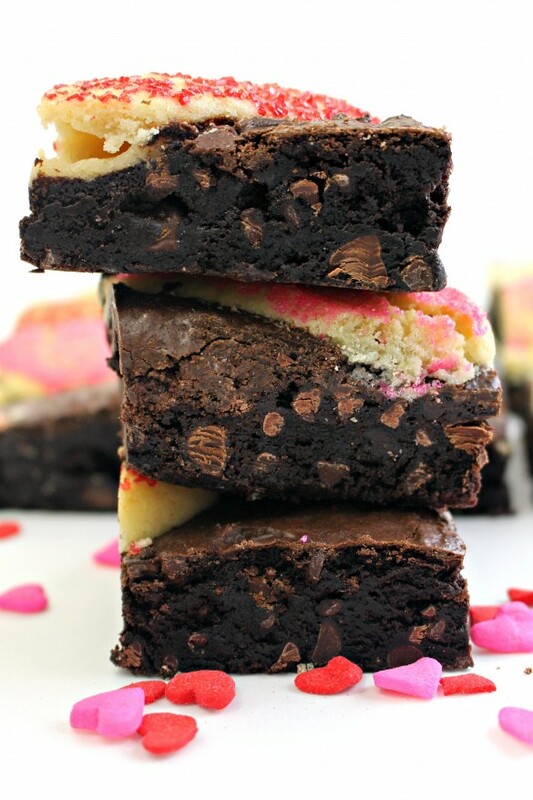 Sugar Cookie Valentine Brownies are a procrastinator’s Valentine’s Day dream. This recipe adds packaged refrigerator sugar cookie dough in heart shapes to a simple but oh-so-fudgy brownie to create a pan of deliciousness that tastes great, sparkles with holiday cheer, and can be eaten immediately or mailed to someone special. Though this festive treat can be made even more time saving by using boxed brownie mix, I urge you to try this fudgy brownie recipe. I’ve used these brownies for Hugs and Kisses Brownies, Chocolate Mint Brownie Bites, and Fudgy Brownie Fish. They are a hit every time! The original recipe was developed by Nestle’s so you know the emphasis is going to be on chocolate. I have shipped pans of these brownies in military care packages that took weeks to arrive and have been assured that they arrived still fabulously chewy. Add chocolate chips inside and heart shaped sugar cookies on top to make an impressive dessert that will get raves. The inspiration for Sugar Cookie Valentine Brownies came from several places. First I saw this recipe for brownies topped with peanut butter cookies. 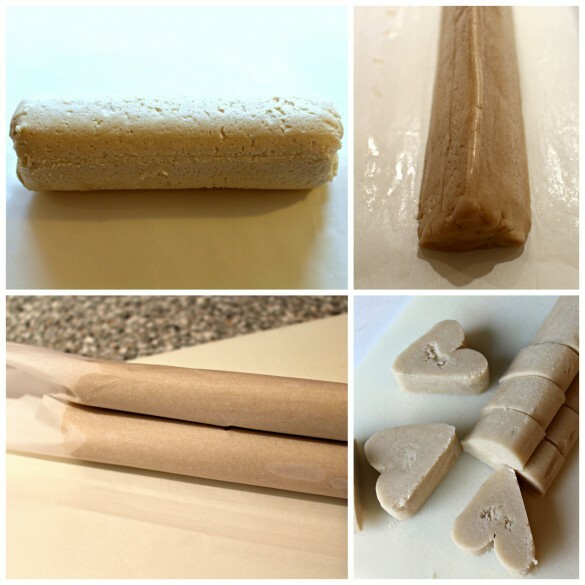 Then I saw this post on how to turn a tube of sugar cookie dough into slice-and-bake sugar cookie hearts. I put the ideas together to make Sugar Cookie Valentine Brownies. The addition of sparkling sugar was my idea (no surprise) because I am always in favor of sparkle and sprinkles! Sugar Cookie Valentine Brownies were included in my “Warm Caring Thoughts” Valentine’s Day military care package for my “adopted” sailor. (Check back in a few days to see the rest of the package.) I think these festive brownies would add sparkle to anyone’s Valentine’s Day! First create a triangle shape by gently pressing the dough toward the cutting board to flatten the surface touching the cutting board. Turn the dough log to flatten all three sides of the triangle shape. Wrap the dough in the parchment paper. To create the indentation at the top of a heart, press the back of a large knife down the middle of one of the sides of the dough log. Use your fingers to round the edges on either side of the indentation to complete the heart shape. Freeze the dough for at least 2 hours or overnight until firm. The dough must be firm to hold the heart shape when cut. When the dough has firmed, cut into ¾”-1” thick heart shaped slices. Press the top of each heart onto a plate of decorating sugar or sprinkles. Keep the hearts in the freezer while preparing the brownie batter. Prepare one 9” x 13” pan depending on use. If you plan to mail the entire pan of brownies in a disposable pan, lightly grease the disposable pan with vegetable shortening. If you plan to remove the brownies from the baking pan ( to wrap whole, to wrap after cutting, or to cut and eat at home), foil line the baking pan, allowing for a little overhang (for easy lifting later) and spray with non-stick spray. 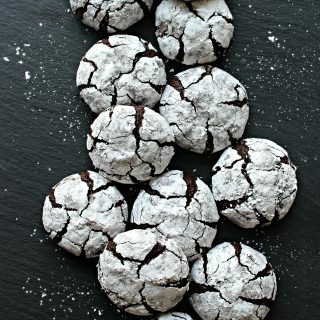 In a medium bowl, whisk together the flour, cocoa, baking powder, salt and espresso powder. Set aside. In the bowl of an electric mixer, combine the shortening, sugar, and eggs. Beat until light in color and fluffy (about 3 minutes). Gradually add in the flour mixture, until combined. Stir in the semisweet and mini chocolate chips. Scoop the batter into the prepared pan (it will be thick), using a spatula or spoon to even out the batter into the entire pan and smooth the surface. 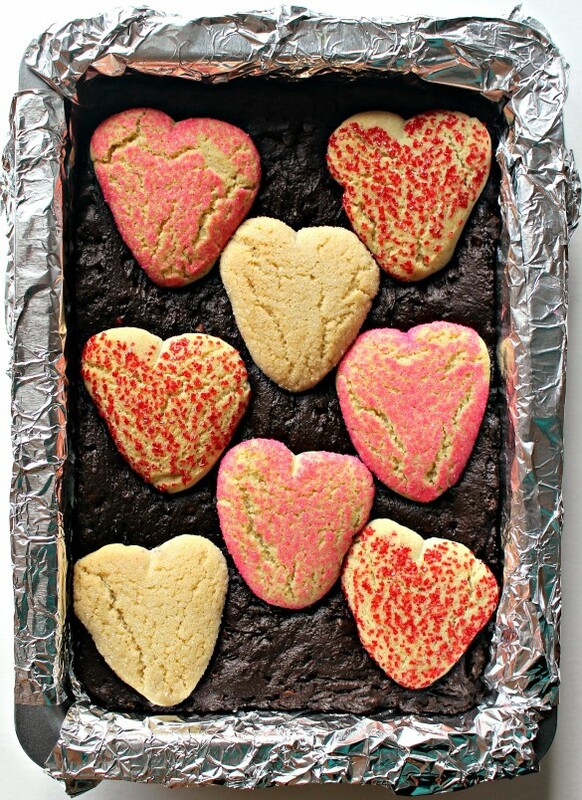 Place the sugar cookie heart on top of the brownie batter 1 ½”-2” apart. Do not press into the batter. The cookies will flatten and spread while baking. Bake for 25-28 minutes. The toothpick test doesn’t work very well because of all of the melting chocolate chips. If the top is firm after 25 minutes, take it out. (Mine baked for 25 minutes). Cool completely in the pan. Store brownies at room temperature in an airtight container or zip lock bag for at least 2 weeks. If using a disposable pan, make sure to cool completely before wrapping the pan in foil then in plastic wrap. Cut brownies can be double wrapped in plastic or wrapped in foil then plastic before storing in an airtight container or zip lock bag. Wendy, I love these!!! Oh my goodness they look so cute, and so delicious. I also love how pretty they look when cut up. Totally pinning 🙂 Also, I would never have pegged you as a procrastinator…. I think you might be selling yourself short. Happy Valentine’s Day! It’s a puzzle you can put together but what do you do when there are missing pieces? Haha – lovely idea – actually so smart. Can’t go wrong with brownies! Great ideas for care packages! I send care packages to my college son, so I love getting new ideas. Hi, Laura! I started writing The Monday Box when I my son left for college and I had a hard time finding recipes for cookies to send that would stay fresh a long time. All of The Monday Box recipes stay fresh for at least 5 days and many stay fresh for week! I hope you find something your son would enjoy! Thanks for stopping by from Wonderful Wednesday! 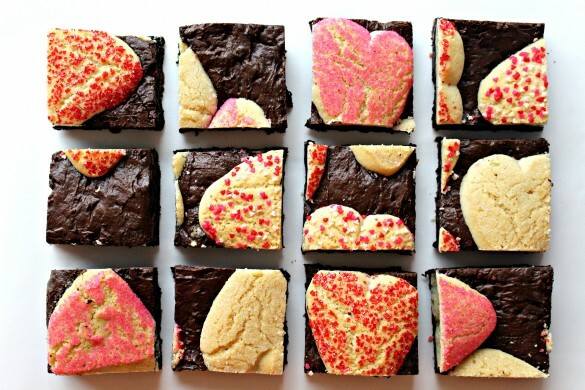 Beautiful sugar cookie valentine brownies Wnedy. I am in love with it. thanks for sharing with Hearth and soul blog hop. pinning and tweeting. Thanks, Swathi! Is fun and easy to turn these brownies into a Valentine! Thank you for hosting, pinning, and tweeting!! 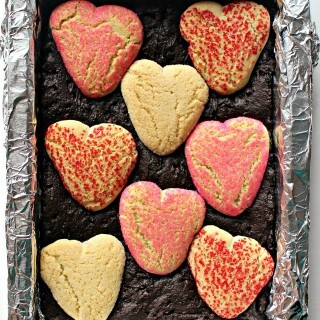 What a fantastic idea, your Sugar Cookie Valentine Brownies will be perfect for a special Valentine! Thanks so much for sharing this awesome post with us at Full Plate Thursday. Have a great week and hope to see you again real soon! Hi, Miz Helen! 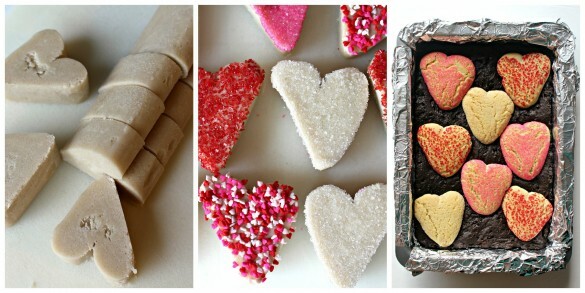 The sugar cookies were a fun way to turn brownies into a Valentine celebration! Thanks for hosting Full Plate Thursday! OMG WHAT?! Sugar cookies baked ON TOP OF brownies! This is just the ultimate DELICIOUSNESS! Thanks, GiGi! I loved how super simple it is to turn slice-and-bake dough into hearts. No rolling and no cookie cutter! What a fabulous, fun recipe, Wendy! I love how easy it is to make. Pinning to my Valentine’s Day Board on Pinterest. Thank you so much for sharing, and for being a part of the Hearth and Soul Link Party. Hope to see you at the first Hearth and Soul Link Party of 2019 on 7th January. Happy New Year! Thanks for sharing at the What’s for Dinner party.